The single most common request we receive is for video tutorials of ESR so that people can both get a look at the concepts and mechanics to decide if Et sans résultat! is what they are looking for, and to help them understand what they read in The Complete Player's Guide. Thanks for this! I played in your last game at Historicon and have played several times since but having some tutorials will give me a double check that we are getting it right. I'd have preferred it though if they'd spent even more time showing examples of how Directive Orders work. That has given the people I play with the most trouble. I am sure they are open to continuous improvement and would welcome constructive feedback and questions. I think using YouTube and or other platforms would be useful to a number of rule sets, to demonstrate visually how the "rules actually work". I watched and learned from all six tutorials. They are truly excellent and explained many nuances which I had not understood before. Well done. Lascaris – Glad you like them. Hope we see you again this convention season! Puddinhead Johnson – Please note these are our first tutorials and they are explicitly intended to provide a basic overview of game play to help new players and prospective players get their head around the concepts and ideas as one of the most common things we hear is derivations of, "ESR is unlike any of the other wargames I play". Of course it is a question of time and resources but we do hope to provide additional, more 'in-depth' followups to cover specific areas and since 'Command' is really the heart and central focus of ESR, you can be assured any such effort will dwell there. rmcaras – Yes indeed and thank you. These basic tutorial have been long requested by many and we put them off for far too long, hopefully they will make it easier for people to decide if ESR is what they are looking for and get a sense of how what they are reading in The Complete Player's Guide translates to the tabletop. 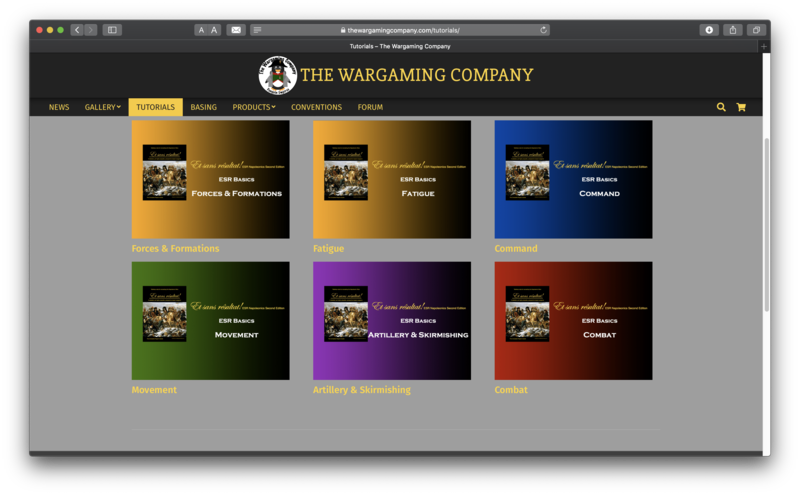 Wargamorium – Thank you, very glad you are finding them useful!